What takes more life-Road Mishaps or Terrorism ? Disclaimer : We do not own and do not claim to own all the images appearing on our website/ Facebook page. The images belong to their respective owners, who have copyright over them. The images are taken from various different sources. If you feel that any image violates your copyright, please write to gyanwalebaba.com to have it taken down. India’s daily death toll due to road accidents is more than four times the annual death toll from terrorism. As many as 139,671 people lost their lives on India’s roads during 2014 – 382 deaths every day. For comparison, the total number of deaths (civilians and security personnel) due to terrorism-related incidents was 83 in all of 2014. Predictably, most of those who die on the roads perish because of preventable causes: speeding, drink driving and overloading. The large number of deaths among pedestrians and cyclists also indicates that any moves to get people to shun motorised transport in favor of these environmentally-friendly modes are not likely to succeed. After falling for two years, the number of road accident deaths in India rose again during 2014, according to the latest report from the Ministry of Road Transport & Highways. The majority of these deaths, nearly three-fourths, have been termed as ‘fault of the driver’, a catch-all term that includes speeding, drink driving, driving on wrong side of the road and not signaling properly. Speeding is the single factor responsible for the maximum number of deaths on Indian roads. During 2014, 57,844 deaths – 41% of the total – were due to accidents caused by speeding. Speeding has accounted for a similar share in the earlier years as well and has consistently accounted for over 50,000 deaths on roads for the past several years. Speeding is typically the easiest factor to control, and a small reduction in vehicle speed yields disproportionate results in terms of safety. These numbers suggest some big gains can be made with directed effort. India’s national and state highways, which together account for less than 5% of the road network, accounted for 63% of the total road deaths during 2014. Speeds on highways are typically higher than speeds within city limits and are often violated because of lax enforcement. The Mumbai-Pune Expressway is a prime example; the speed limit of 80 km/hour is observed more in the breach. Strict enforcement of speed limits on highways could save thousands of lives. Overloading of vehicles, particularly trucks, makes them hard to control, especially when they need to brake. However, it is a common practice on Indian highways. Similarly, driving with protruding loads – for instance steel rods protruding out of trucks – is also a common sight on Indian roads, albeit illegal. These two causes accounted for 36,543 deaths in 2014. Both of these are preventable causes and have been showing a declining trend for the past few years. Again, since the heavy truck traffic is largely on national and state highways, better monitoring and enforcement can save lives. Advances in automotive technology mean that a drunken driver safely belted in can often walk away from an accident. The pedestrians/two-wheelers/smaller vehicles that he/she hits may not be as lucky. Madhya Pradesh and Bihar account for almost a quarter of all deaths due to drink driving. Among smaller states, Haryana and Uttarakhand have tolls way higher than many larger states. Traffic police in major cities like Mumbai and Delhi have been conducting sustained campaigns against drink driving in response to high-profile cases. Going by the numbers, such campaigns are particularly needed in Madhya Pradesh, Bihar, Haryana and Uttarakhand as well. Two-wheelers account for the largest share of vehicles on Indian roads. So, it is not a surprise that they also account for the largest number of fatalities. In 2014, 30% of all road deaths were of riders/passengers on two-wheelers, while bicyclists accounted for 3% and pedestrians for 9%. Wearing a helmet can reduce the risk of severe injury by 72% and the risk of death by 39%, according to the World Health Organisation. However, wearing a helmet is mandatory only in a handful of Indian cities, and only for two-wheeler riders, not other passengers. Helmets are not mandatory for cyclists. India’s two-wheeler density is a fraction of other middle-income nations, such as Vietnam, Indonesia and Malaysia. As India’s economy grows, so will the number of two-wheelers – and safety issues will have to be tackled. Meanwhile, in what can only be termed as bizarre, there have been protests against making helmets mandatory in cities like Pune and Madurai, spearheaded by lawmakers and lawyers. The 16,000-plus deaths among pedestrians and cyclists indicate that Indian roads are not very friendly to either of the two most vulnerable road users. Any attempts to clean up city air by urging people to shun cars/bikes and pedal/walk instead are doomed to fail unless pedestrians and cyclists can move around safely without being bullied by larger vehicles. That will require proper pavements and pedestrian crossings, along with some common courtesy. India’s 50 largest cities accounted for 16,611 road fatalities in 2014, with Delhi, Chennai and Bengaluru taking the top three spots. 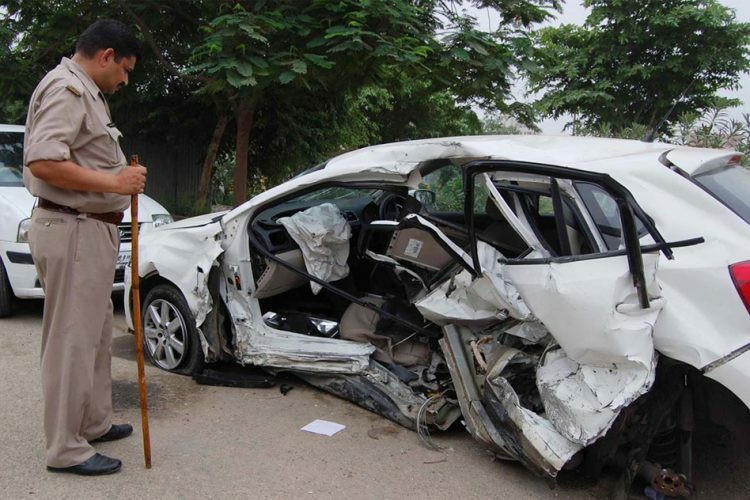 The number of road-accident deaths has fallen in Delhi and Chennai consistently. Monitoring road users and enforcing laws is easier in bigger cities than other areas. The Delhi Metro could also have played a part in making the capital safer. The mass-transit system ferries more than two million people every day and helps keep vehicles off roads, reducing congestion and accidents. Mumbai is another standout in terms of road safety; it has fewer road deaths compared to smaller cities like Chennai, Bengaluru or Kanpur. This is because Mumbai has fewer vehicles on the roads in proportion to its population, as it has a reasonably efficient, albeit greatly overloaded, mass-transit system. It is another matter that many more people are killed on railway tracks than on roads in Mumbai due to inadequate safety measures. A recent RTI query reveals that eight people die every day in Mumbai – while crossing railway tracks or because of falling from overcrowded trains. Building more public transport could play a big role in improving India’s urban road safety. NextGoogle’s Nexus Launch Event Today.